A Time to Dance; Magnificat and Nunc dimittis ‘Hatfield Service’; Men & Angels. The Birmingham based choir, Ex Cathedra has long been at the forefront of British choral music, notably through their educational work and concerts and recordings of early music and Baroque music from Central and South America, a particular research interest for their inspirational director, Jeffry Skidmore. 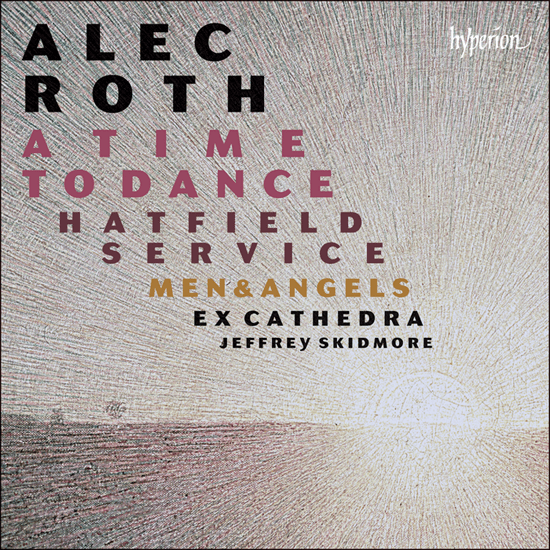 But they also venture into more recent repertoire, as evidenced by their latest CD of music by Alex Roth. Commissioned for the Summer Music Society of Dorset for their 50th anniversary, the cantata A Time to Dance was first performed by Ex Cathedra in 2012. It is in four sections, representing jointly the seasons and the times of day, with an opening Processional and Prologue and a concluding Epilogue and After-dance, and lasts about an hour. Another quadruple influence is present in the opening Processional, based on the ‘For every thing there is a season’ passage from Ecclesiastes and its emphasis on times, seasons, love and dance. The remaining sections are based on 29 poems, ranging from Ovid via Donne, Herrick, Blake, and Yeats to the more recent Robert Bridges. The music is influenced by Shakespeare, Bach and Jeffry Skidmore, with whom the composer has worked over recent years. A Time to Dance was premiered alongside Bach’s Magnificat, and uses the same vocal and (period) instrumental forces, with the addition of an expanded percussion section, including a desk-bell, washboard and dinner gong. It is an approachable and easily understood piece, with an eclectic musical style incorporating hints from wide variety of music genres, from plainchant to big-band combined with moments of real humour and sensuality. Roth makes imaginative use of the instruments, notably the three trumpets. There are several moments of beauty, including Matthew Venner’s inspired singing of the setting of Blake’s The Evening Star. The other soloists (Grace Davidson, Samuel Boden and Greg Skidmore) are also from singers première league. The Ex Cathedra choir are also on top form. This would be worth seeing in a live performance – I would think there would be many possibilities for imaginative staging. The CD is completed by two other Roth pieces, the Hatfield Service Magnificat and Nunc dimittis, written to be performed with the conductor played a chamber organ with their left hand while conducting with their right, and the more recent Men & Angels to a text by George Herbert, written for unaccompanied voices with the upper voices representing the Angels and the lower voices, appropriately, the Men.